Hopelessly Devoted Bibliophile: A Guest Post from Lisa Heathfield, author of Seed! A Guest Post from Lisa Heathfield, author of Seed! It's Tuesday, which means you're probably partially glad that it's no longer Monday, but mainly upset that Friday is still so far away. It's okay, I know exactly how you feel. And, while I can't fast forward the week, I can give you a guest post from an awesome author to ease the pain! So, here you go. 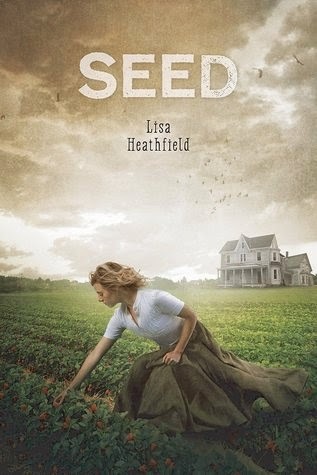 The spotlight is on Lisa Heathfield, author of Seed, today. Lisa is going to share with us some of her favorite reads, let's take a look! I've read so many hundreds of amazing books, that it's difficult to whittle it down to my favourites. However, there are a stand-out few from various stages of my life. I think my all-time favourite book has to be 'The Folk of the Faraway Tree', by Enid Blyton. I've read it more times than I can count and I never get bored of it. When I was younger, I would climb the biggest trees, just hoping for a glimpse of Moon-face. Even now, when I'm walking in a forest, I'm still looking out for it. One day, I know I'll find it. I'll side-step Dame Washalot's water and slide down the slippery-slip, if it's the last thing I do. Having been introduced to the horrors of the second world war, in Ian Serraillier's 'The Silver Sword' and been terrified by Susan Cooper's 'The Dark is Rising', my early teenage years were swamped with Judy Blume. The stand-outs? 'Forever' and 'Are you there God? It's me, Margaret'. My friends and I would read them out to each other and I'd be wide-eyed at the world ahead of me. Another early teenage favourite was definitely Virginia Andrews' 'Flowers in the Attic'. It was the first book to truly make me bawl my eyes out - that kind of stuttering, can't breathe, can't think crying. And I loved it. Then there was J.D. Salinger's 'The Catcher in the Rye'. I'd never read anything like it and even now, years later, I get the same feeling just thinking about it. At school, I studied Nathaniel Hawthorne's 'The Scarlet Letter' and William Faulkner's 'As I Lay Dying' and I fell head-over-heels in love with them both. In my late teenage years, I stepped seamlessly into the words of Margaret Atwood. I remember my first book of hers. I was going home from London and I bought a copy of 'Cat's Eye' at Waterloo station. I was stopped in my tracks by the beauty of her writing. I remember being torn between wanting to underline Atwood's amazing sentences and not wanting to mark this beautiful book. I think it changed everything. In adult years, Markus Zusak's 'The Book Thief' is the one that stunned me. As with Margaret Atwood, I'd find myself reading and re-reading lines just to soak in them. And now I've almost come full-circle, as I spend my reading hours deep in fiction for teenagers. There are too many brilliant ones, but a shining few from the last few years are: 'Before I Die', by Jenny Downham, 'The Bunker Diary', by Kevin Brooks, 'All the Bright Places', by Jennifer Niven, 'Me and Mr J', by Rachel McIntyre, 'We Were Liars', by E. Lockhart, Suzanne Collins' 'The Hunger Games' (of course!) and the brilliant 'Charm and Strange', by Stephanie Kuehn. When people ask me how I learned to write, I only have one answer - that the books I've read have been my teacher. Each and every one has been part of the road that has led me to being a published author. And for every word, I'm eternally grateful. Many thanks to Lisa for sharing her reading journey! Make sure to add Seed to your reading list and happy reading!